I am currently approaching two years as a minimalist so I wanted to share with you how I first started to declutter my home and the tricks to maintaining it. You don't have to be in the thought process to becoming a minimalist to benefit of this blog post; everyone could use these tools to have a home that inspires, relaxes and brings out the creativity! As Mikael Cho writes on Lifehacker.com, "Whether it be your closet or office desk, excess things in your surroundings can have a negative impact on your ability to focus and process information. That’s exactly what neuroscientists at Princeton University found when they looked at people’s task performance in an organized versus disorganized environment. The results of the study showed that physical clutter in your surroundings competes for your attention, resulting in decreased performance and increased stress." Let me be completely honest with you, I used to be a hoarder. Nothing crazy like you see on some of those hoarder shows but I would save and get sentimental about EVERYTHING. Anything from ticket stubs, rocks (okay, I still collect pretty rocks from the beach,) to clothes, magazines, basically anything that I came across in my existence of living. I had shoeboxes filled with sentimental things from every ex boyfriend I had ever had. Why? No idea, but I have a feeling I am not completely alone on that one. It was so bad that I would get emotional with just the thought of throwing anything away, even things that were broken and of no use at all! Then one day came and I had just had it. I will say that my initial push or motivation was my "exit strategy" to leave my abusive husband. I had to be ready to leave quick and that was not going to happen with all the things I had grown attached to. In my process to make this quick exit I stumbled across the book Minimalism, Live A Meaningful Life. I had never felt such a relief and clarity just by getting rid of all the things I was holding onto. I ended up going back to Sweden that same month and I spent a whole day going through my family's garage filled with all of my old junk. My ex boyfriend's shoeboxes went; all the meaningless things I had dragged with me from my US address to my Swedish address (and spent a lot of money in shipping costs I might add,) all got driven to the local recycling and trash station for a final goodbye. My closet back home here in the States went from about 400 items of clothing to... drumroll please... 38 (!) and that's including my winter coats! 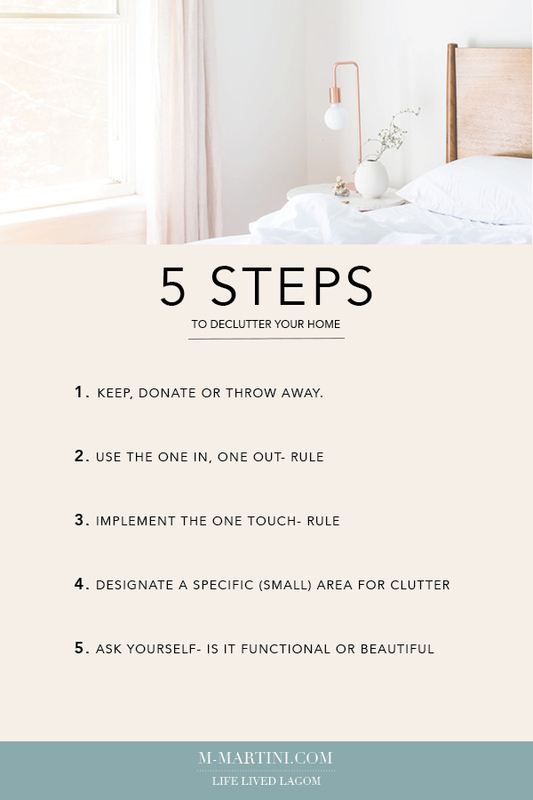 Keeping your home tidy and clutter-less is by no means a one time process. 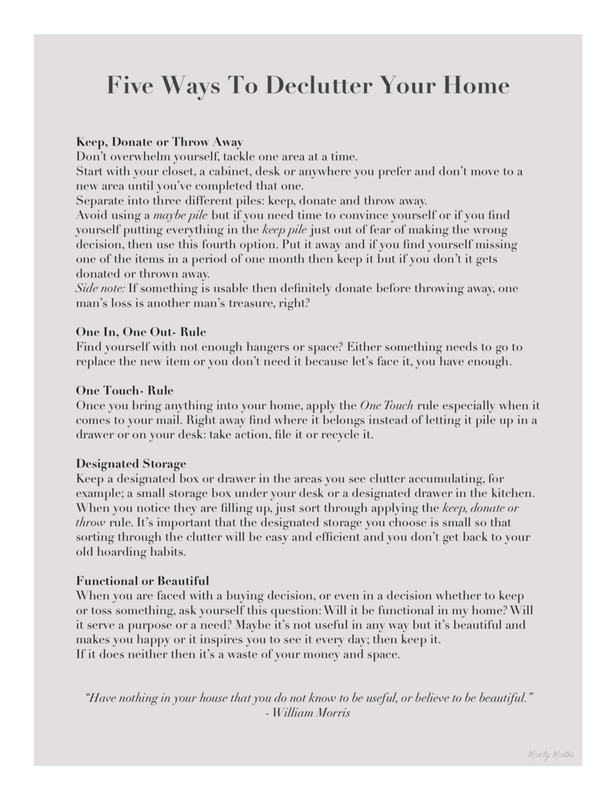 With time you will find yourself holding onto that favorite t-shirt with holes on it and find your cabinets, closet and boxes fill up, but hopefully with these rules/guidelines you will be able to stay committed to keeping your home a place that makes you happy to spend time in. I've noticed a great change in my mental wellbeing and productivity since I made this switch and it's only becoming easier and more natural way of living with time. The list below is downloadable so you can keep it on your computer desktop or print it as a reminder.